Hot on the heels of the 1.9-inch Ruptures are the larger 2.2-inch versions from JConcepts. 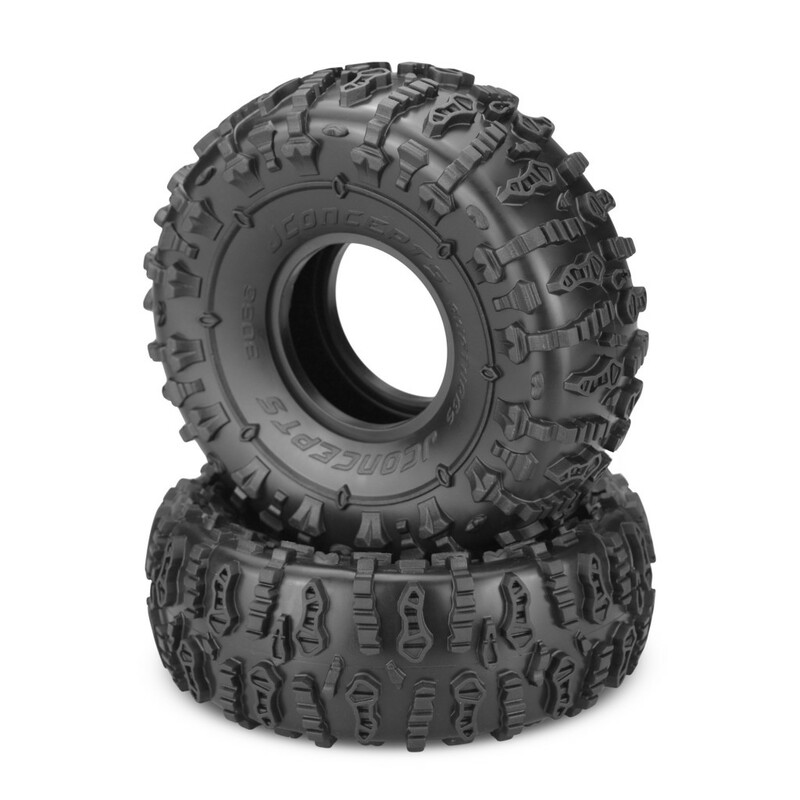 These tires are great for any 2.2-inch trail truck or crawler and feature an aggressive tread pattern that is sure to provide grip on many surfaces. The soft rubber compound also aids in getting maximum traction. For more new products be sure to check out our Hot News and New Stuff forum, updated daily! The super soft green compound grips like a monster, while the tall (151mm) profile JConcepts tire for 2.2” wheels tackles even the most treacherous terrain. 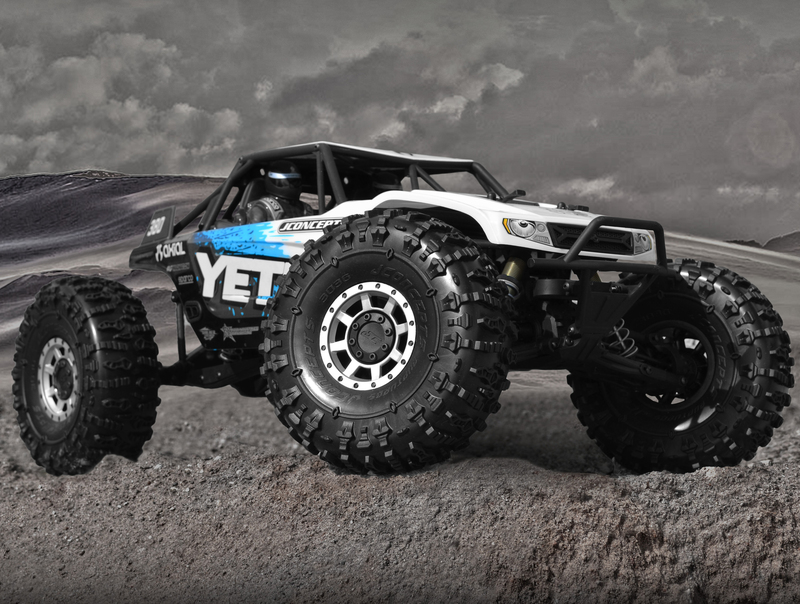 Perfect for vehicles like the Axial Yeti, the Ruptures are an extremely tacky yet versatile tire crawling and rock racing drivers lust for. The design starts with a layout of individual “large islands” that react to directional and forward loading characteristics like a soft gummy candy. The long horizontal attack bars are connected with solid sidewall detail which braces the sidewall for the high impact situations. The center “mini islands” help maintain spinning speed and at half height provide some space to sling clean during those dirtier runs. The entire top level of tread has built-in cuts and recesses which provide a sharp edge. A sidewall radial rib connected with a dual position arrow help maintain stability and help the driver squeak out of a tough situation. The carcass itself is extremely pliable which conforms to the vast majority of obstacles. Inside the carcass, JConcepts features a connected “Y” loop ribbing design which blends carefully into the sidewall. The bracing supports the lower half of the tire while maintaining the upper flex characteristics. The tires include a soft open cell foam insert capable of standing up the super soft compound but flexible enough for sharp terrain. Race a path to JConcepts for that all important traction, consistency and all out performance from the company known for World Proven Innovation and Design.